Corporate support is crucial to protect, preserve and enhance the Assabet, Sudbury, and Concord Rivers and their watersheds. Our Corporate Sponsor Program provides businesses and corporations with an opportunity to take a leading role in preserving their community's environmental well-being. Where does your Corporate Philanthropy Program fit into our mission? Throughout the year OARS works to restore the rivers' water quality and ecological health. In addition, each September hundreds of volunteers spend one Saturday removing tons of trash - tires, bicycles, bottles, batteries, and cans - from the rivers. 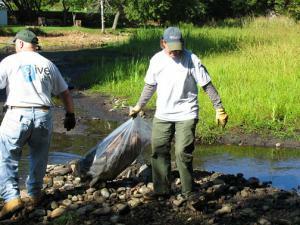 The 25th Annual River Cleanup will take place on Saturday, September 17th, 2011. OARS' well-respected volunteer water quality monitoring program has been providing reliable scientific information about the three rivers since 1992. This work is critical to our ability to understand the condition of the rivers and offers a unique educational opportunity for citizens to learn and participate in environmental science. Donate in-kind services such as office material and equipment, printing services, cleanup supplies, and other non-monetary support. To learn more about Corporate Memberships and our Sponsor Program, please contact Julia Khorana.